I'm sure you're wondering why I've been on hiatus for the longest time! Partly, because I was too preoccupied with "life" in general, haha, and we've had no helper ever since so I've been extra busy around the house. But the main reason is because I am turning over a new leaf and moving to another domain. I have mixed feelings as I write this... a bittersweet moment for Lique's Antics. Because I am here to say goodbye. One, I lost my writing mojo for quite some time. I have a number of posts pending in my drafts, and a couple of ideas waiting to be written. But I never got to publish them eventually. I just didn't feel like writing anymore. Don't get me wrong, I loved keeping posts about our antics. This blog started off as my online journal anyway, and it's nice to write stories and get to share them with your readers. But there came a point when I just wanted to stop. Two, I don't feel as comfortable sharing about my family and my kids as much as before. My husband and I have had that talk about privacy and security, which is even more crucial in this technological day and age. Three, I decided to pursue my passion for design and, therefore, I've been working on my other website. Yes, I am moving and rebranding! I've moved past the mommy blogger phase and am now focused on my creative pursuit. Don't fret, when I said that I'm not saying goodbye for good, it means I'll still be sharing with you some of my motherhood and homeschool chronicles and other antics over at my Instagram Feed and at my Facebook page, @liquesantics. I will also be sharing some party antics and DIY crafts in my new website - those topics which I'm very happy to keep sharing with you guys. You'll also find me over at the @ldcreativepursuits Instagram and Facebook page. Finally, I want to say thank YOU (yes you!) 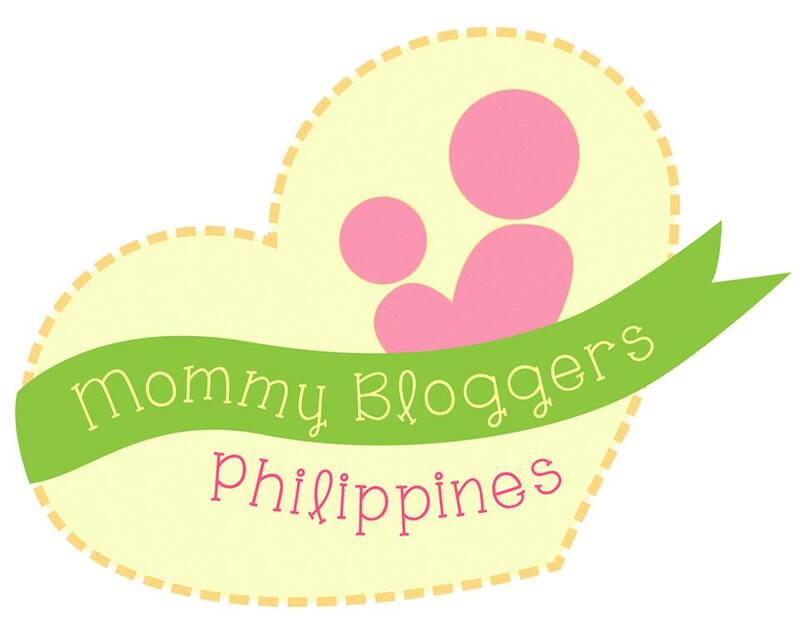 for keeping up with my antics and dropping by this lil' ol' blog of mine. See you on on the other side (of cyberspace)! It's been a while, and I have a couple of pending posts that need attention! But hey, mommies are always B-U-S-Y right? Don't be alarmed with the blog title... NO, I am NOT PREGNANT! hehe, but my sister is! And I'm excited for her! My kids are excited to get a cousin too! Yay! I also have friends who are expecting or just gave birth, and it makes me happy seeing them carrying those baby bumps and experiencing the miracle of birth. I can still remember when I was pregnant and gave birth to my two little darlings. Each experience was different, but both were simply joyful. That being said, I recently shared a photo of my sister on my Instagram account, and with it, shared my thoughts about the Beauty of Pregnancy. Don't you think it's amazing, that a mother can carry life inside her? And how that belly grows into a nurturing home for nine months, at most? I was simply happy that my sister asked my to shoot her grown baby bump. Of course I said yes! Oo na, feeling photographer-slash-stylist nako. Or trigger-happy lang talaga. But I had a lot of fun doing the shoot. Also, I wanted to return the favor, since my sister took shots of me too when I was pregnant. Yes, ganon kami mag-bonding, pareho kami mahilig magpicture at magpapicture, haha. So I'm happy to share some more of her photos. ...[I think] as a woman, having a maternity photoshoot, whether at home or at a studio, is necessary. But you don't have to do complicated poses or pick fancy fabric...just pose and smile! Be proud of that precious miracle! To add to that statement, I think women should also be proud about the changes that pregnancy has brought about in their body, and that they should have a memory of that, through photos. Care to share your thoughts on this post? I'd appreciate any feedback, just leave some on the comment box below. I have a lot of friends who gave birth or are about to give birth this year... And I told my husband this, there is obviously a "baby boom", hehe. Kidding aside, I suddenly had a thought about the gifts we give to our pregnant friends... they are mostly just for the baby. 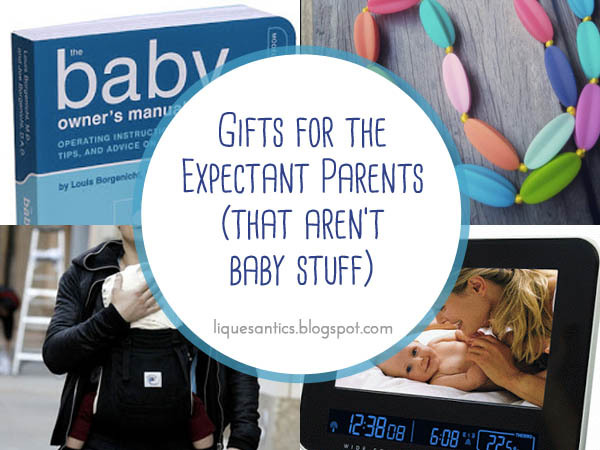 Don't get me wrong, expectant parents love getting gifts for their baby, and who doesn't adore buying those little outfits and amusing toys? But the Pregnancy Journey wouldn't be complete without the parents who started it all: the Mother who carries the child for nine moths or so, the Father who makes sure that his wife and child are safe and secure. That being said, I just thought about writing on what other possible gifts could we give the expectant parents? Yes, that thought just went into my head, so I am writing about it now...haha! This was a gift from one of our friends, and it's very helpful! Not to mention very geeky, and I mean that in the best way! The illustrations in this book are quirky and it is, in fact, easy to understand and follow. 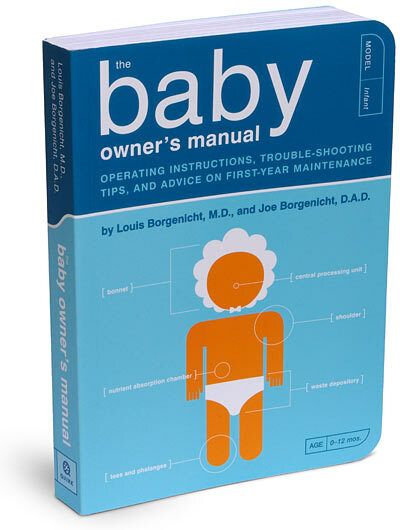 Great gift for first time parents! I don't actually know where they bought it, but perhaps it's in your favorite bookstore :) You can also catch this gem on Amazon/Kindle or iTunes, if you want a digital copy. If your friend plans on nursing, whether for just a few months or for a couple of years, it would be really helpful to give them nursing clothes or a nursing cover. It wouldn't only help the breastfeeding journey easier and more comfortable, but also it would benefit the baby too, so it's a win-win! Personally, we don't have this, but it's something I would have loved to have during my pregnancies and even post-partum! Again, if your friend plans on nursing, why not give her yummy goodies too? I personally tried a couple of local pastries that are not only delicious, but also very effective in helping boost milk supply. And mom and dad can share them too (don't worry, dad won't lactate, hehe). Some also offer prenatal snacks for expectant moms that have Wheat Germ (rich source of folate) & superfood Chia Seeds! Lactation pastries have "galactagogues" (milk-increasing ingredients) such as fiber-and-iron-rich oats, Omega-3-flowing flax seed, cholesterol-and-blood-sugar-lowing fenugreek, and Vitamin-B-packed brewer’s yeast. To know more about the different lactation cookie brands, READ ALSO: What are Lactation Goodies? More and more parents are being hands-on when it come to taking care of their children. And dads are no exception. My husband would almost always say that there should be more "masculine" or neutral baby stuff for the dads too! And I agree. Don't you? Why not give your dad friend something he'd be happy to carry around or wear, like a neutral or "manly" diaper bag or sling. There are various shapewears now for every stage of motherhood, and I personally got to use a girdle, post pregnancy. It was a gift from my mom (thanks mama!). It helped me to get back in shape. And for those who've had C-sections, it serves as a support garment. I'm sure your mommy friend would appreciate to get one too, whether it be a maternity tank, girdle, or belly bands. Who wouldn't love jewelry as a gift? It's a plus if the baby can chew on it when he's teething. YAS! 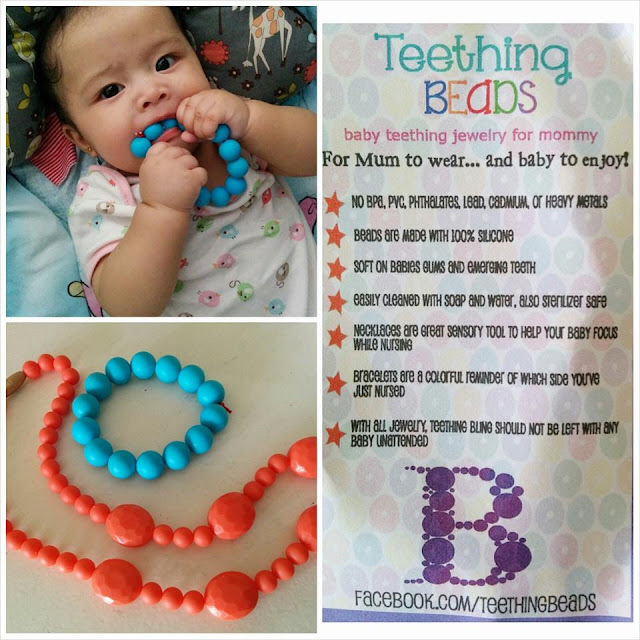 I personally own a teething necklace and bracelet. I wear it occasionally, and when my daughter was younger, it was one of her favorite accessories and teether, hehe. Twinning with your kids is SO "in" now. I mean, who doesn't find it adorable that you have your own "mini me"? In this digital age, we take a LOT of photos... I mean a LOT. And if your friends are first time parents, they will definitely get the unlimited baby picture taking syndrome as soon as their bundle of joy comes out! 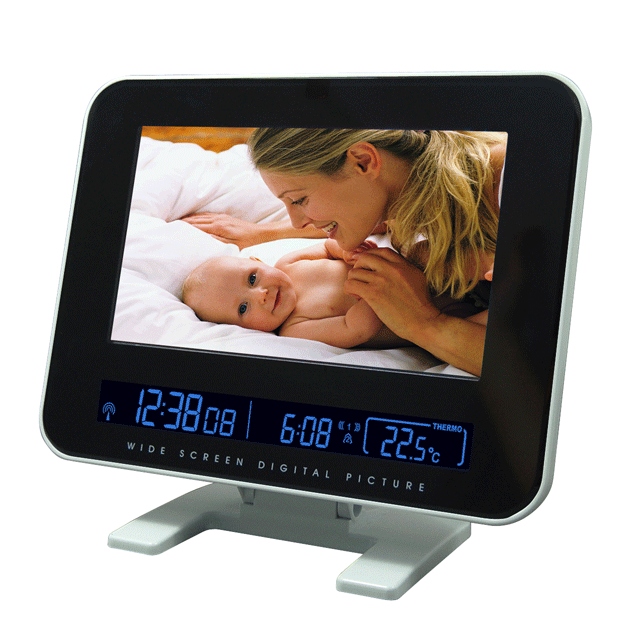 So, a digital photo frame would be a wonderful gift for storing those numerous baby photos and milestones. I believe you can get some at CD-R King or appliance stores. Family photos are one of the most treasured keepsakes. 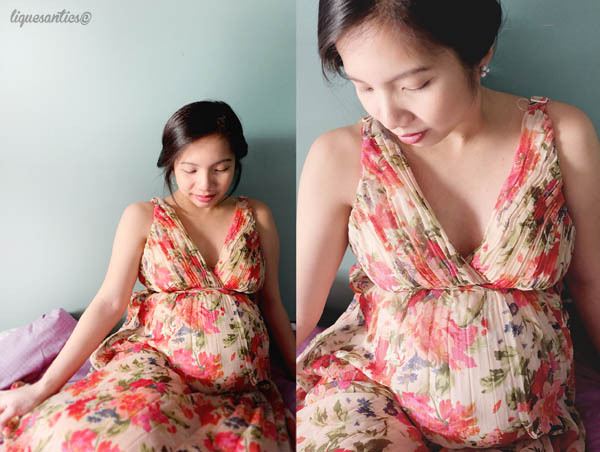 It would definitely be a unique and thoughtful gift for any expectant family to have a photoshoot: maternity, newborn, or family portrait. I'm a frustrated chef and baker. There, I said it! I watch Cupcake Wars, Giada at Home, Barefoot Contessa, just to name a few... and I just enjoy watching them cook and bake! So last Saturday, Kiel and I attended a baking class together. Yes! It was a Parent and Child workshop arranged by the celebrity mommy-slash-baker-slash-entrepreneur Bettinna Carlos. I have been her avid follower on Instagram, and we she announced that she was going to have a baking class, I immediately signed up! I wasn't going to miss the chance to learn how to bake, have some bonding time with my child, plus be able to meet Bettinna herself and her daughter, Gummy! And what made it even more exciting and impressive, was that mommy Bettinna and Gummy personally prepared everything, from the buying of ingredients and materials, making the hand-outs and certificates, and prepping the class kitchen and everything else! Another thing I admire about Bettinna is her strong Faith, that's why she has all that energy and perseverance to prepare all this (“I can do all things through him who strengthens me. Philippians 4:13”). She mentioned that she has been praying for this before she finally decided to teach and share her love of baking, which I'm glad she did :) Thank God! We woke up early Saturday morning because the class starts at 9AM. The little boy was excited to learn to bake too, so he woke up extra early for this. The Venue, CCF Center, is right beside Fun Ranch. The Entrance is at the back, near Avilon Zoo. When we got to the kitchen, we were given our handouts and hairnets. Bettinna was very down-to-earth, that's how I describe her... Parang hindi artista yung kaharap ko, because I can tell that she is very passionate about what she teaches and she was very humble. We said a short prayer before the class started, and then she proceeded to sharing about why and how she planned this workshop, by the Lord's grace. Mommy Bettinna then made a demonstration of the 4 goodies we were about to bake, and she was very hands on, walang kyeme kyeme. She was really a teacher to us that day. Needless to say, we enjoyed our day baking, plus we learned a lot! And we're very happy to bake such yummy goodies! Promise, masarap! I especially love the chocolate chip cookies and red velvet cupcakes, which Bettinna shared with us her "secret" recipes. 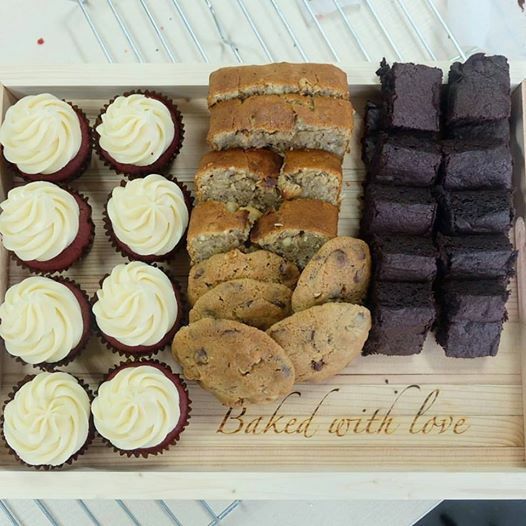 All participants got certificates at the end of the day, and three mom and child pairs were awarded best baking buddies and got to take home a wooden tray from Kids Furniture Hub. If you want to learn to bake with your child too, Bettinna still has 3 upcoming classes! What to Bring: Aprons, kitchen and hand towels, lots and LOTS of containers for take home goodies! Last month, my son celebrated another year of his young, happy life. I can't believe I have a four-year old now! And since he is very vocal about his likes and dislikes (yes, that's how toddlers are), he especially requested for an Avengers themed birthday party! And because this mama loves to DIY parties, I happily obliged to his request. This time, we planned a simple get-together at home. And since our condo unit is just small, we only invited a few neighbours and family. For decorations, we simply made this poster together :) And those drawings surrounding the poster are Kiel's drawings we've collected over time (yes, that's how much he loves the Avengers). Here is the Little Captain America himself in costume! I also arranged a space for the kids to play. Our kiddie shelves were turned and became makeshift benches. For the food, we just ordered from McDonald's because Kiel originally wanted to celebrate at McDonald's but I made a deal with him to just celebrate at home since we only had a few guests. I prepared a few snacks. The Thor treats were little mjolnirs made from pretzel sticks and marshmallows. Captain Snacks were chocolate treats, and the Ironman drinks were Avengers themed too, which we bought at the grocery. We were also expecting guests later that night, so we ordered a Monster Pizza from Jugno's to add to our food. Our Avenger's cake is from Red Ribbon. It's a chocolate cake with marshmallow icing, which we also served to our guests. Although I was a little disappointed because I thought the photo would fill the entire 12x18" of the cake. We compensated by putting Kiel's mini figures around it instead. Overall it was a happy celebration. The most important thing was, Kiel had a lot of fun that day, and we celebrated it on the actual day of his birthday! You can also check out the Pinterest Board I made here to check out some other Avengers party ideas! Follow Lique's board Avengers Party on Pinterest. I haven't blogged for a while here, just because January-February turned out to be busy for us, because it's our (my son, my husband, and myself) birthday months! So anyway, I am happy to report that earlier last January, we got to try the BuriBox. My son was very giddy and happy to receive a parcel especially for him. The smiling face on the BuriBox was too contagious, we were also smiling as we were opening it! I am very happy that the box was delivered with the contents all neatly packed - even bubble-wrapped! 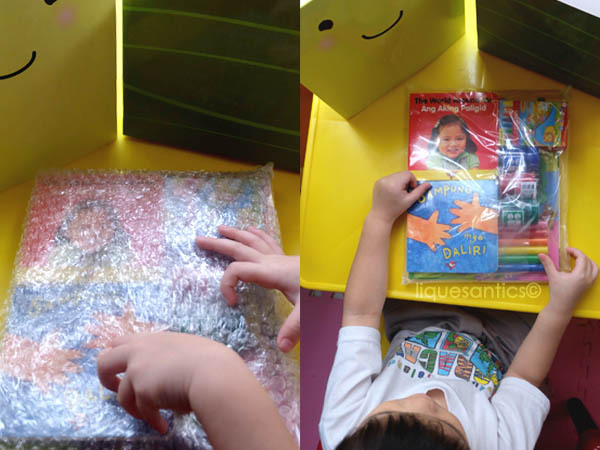 We got a Toddler Buribox, recommended for young Filipino learners, aged 3-5yo. There is also a Young Readers BuriBox for 6-8yo children. So, what is a BuriBox? 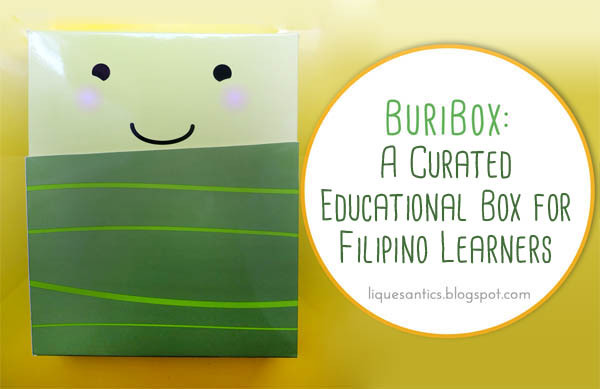 BuriBox is a monthly, curated educational box with Filipino content for kids, delivered to your doorstep. 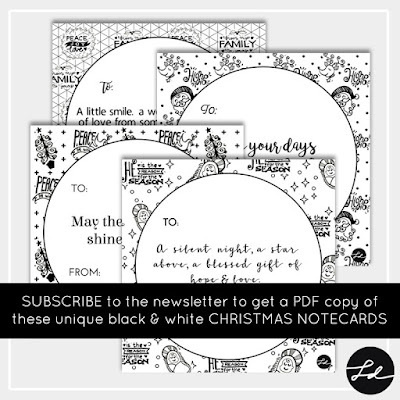 For just 799 pesos, you get 4-5 new books and multiple activities/worksheets and art materials every month. We got 3 books, a coloring book, clay, crayons, poster paints, and a couple of worksheets, that are very well-made by the way, on specialty paper! Both my kids love the books...and the clay! When we opened the box, they immediately wanted to get their hands on the clay, and they cannot be stopped! I'm glad that the box comes with activities, because sometimes I am running out of ideas for activities for my little bulilits, hehe. The BuriBox also comes with a guide for Parents, so don't worry about just improvising, because you have different activities listed on how to use the contents of the box. Turns out, it's also a great way to bond with your child :) We've read the books together, and they already know the song "Sampung mga Daliri" and we love the picture book that has both english and tagalog words describing them. We still have some activities that we have yet to try... Getting this BuriBox was so worth it! What makes the BuriBox special? BuriBox is the brainchild of Adarna House Publishing. 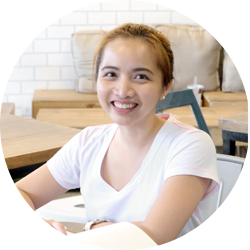 "[Adarna House] was founded to respond to the need of Filipino children to develop their minds through enjoyable learning opportunities and memorable literary experiences. (adarna.com.ph)"
Made for the Filipino child - the books and activities in each BuriBox are situated within the Filipino context and were made especially for Filipino children. Teach your child Filipino the fun way - Ninety percent of BuriBox stories are in two languages (bilingual). Liquesantics has been tapped by Adarna House to offer my readers a special chance to get a BuriBox by just paying the shipping cost of 150php (for the value worth 799)! But it requires a PayPal account though. Simply sign up below, and I'll personally email you the link and instructions of the promo.